I’m thrilled to be collaborating with the team at Pooky to offer you this stunning Alvie Lamp Base and 50cm Hand Blocked Shade worth £150. 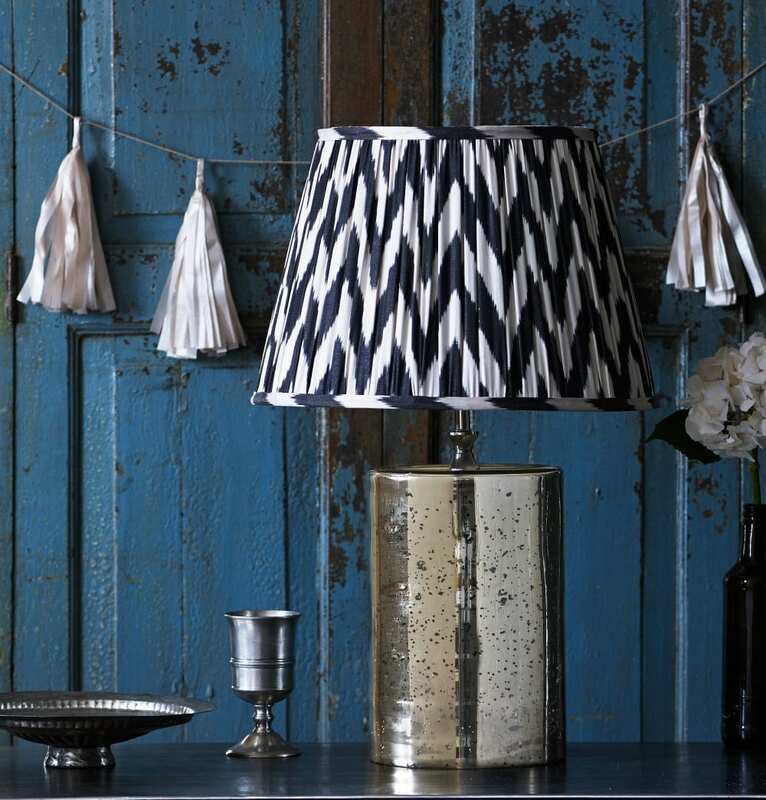 I have one of these gorgeous lamps to giveaway to one lucky winner so if you fancy updating your home and adding this stylish lamp to your décor keep reading. Lighting is a really important addition to any room scheme and can make a whole world of difference to the ambience and mood of the space. In the evening, when lit, the glow from this lamp will accentuate a corner but in the daytime, it can be a stunning addition to your décor. The base is made of mercurised glass, measuring 42cms high with a width and depth of 20cms. The shade is an Empire style with a base width of 50cms. Pooky is an online store with no middlemen offering you great lights at great prices. They specialise in lighting so no distractions with other products, desiging and making lights that look truly spectacular. They travel the world hunting out beautiful fabrics to adorn their lamp bases including raw Indian silks, Turkish silk Ikats and hand printed silks from Rajasthan. And the beauty of their site is the ability to mix and match bases with shades, creating a lamp that suits you perfectly. 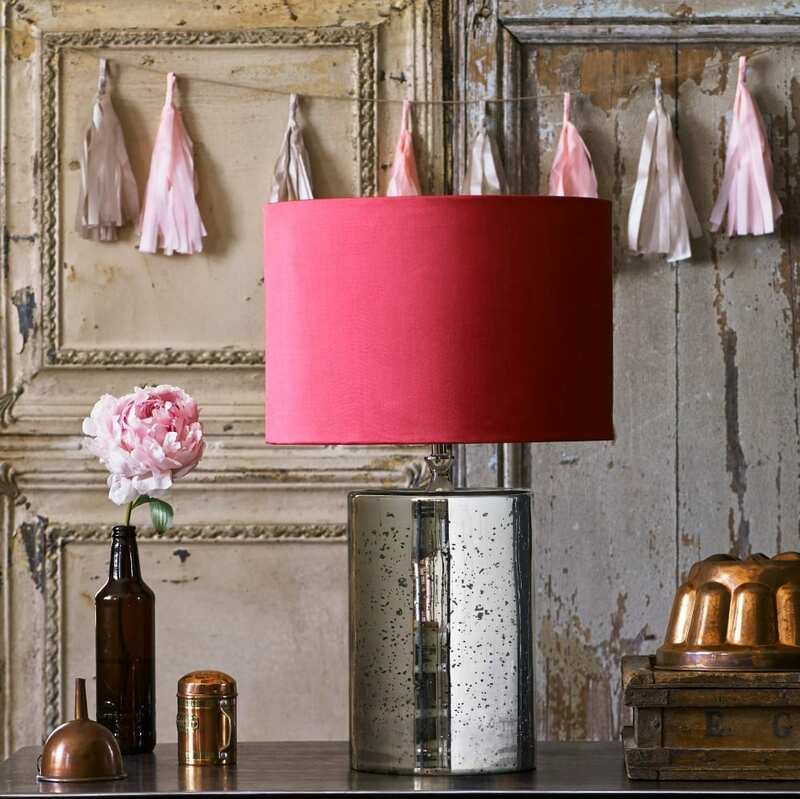 You can see the Alvie Lamp base below, styled with some different shades, including the Raspberry Silk, and Silk Ikat which illustrates how impressive this lamp base is and how stylish it looks in the home. If you’d like to be in with a chance of winning this stunning lamp base and shade, simply follow the instructions in the Rafflecopter below, tweeting the message, and acting on the optional entries too to give yourself extra chances. I’d put it in my new sun room as the sunlight bouncing off the base would look amazing. Then at night I could still get the same effect. Love the light for sure. I’m just about to start decorating my living room (for the first time) and this lamp would be perfect. My lounge, it is gorgeous. I’d put the lamp in the living room. On our side table in the sitting room. I honestly can’t say as I’m moving house in 2 days from Durham to Scotland but I’m sure I will work out the perfect spot to show it off it’s gorgeous! On my telephone table in the hall way. I would put it in my living room to make it cosy as with the weather we are getting winter is fast approaching! Living room, I’d like some subtle light instead of having the ceiling light on all the time. I’d love to put this in the spare bedroom that we’ve just redecorated! I’d absolutely love to win this Pooky Lights Alvie Lamp Base & Shade for my sister’s new garden room – she’s just got the all clear from having the big C so this would light up her life in more ways than one! It would go into my spare bedroom as it compliments the colours beautifully,it’s also the only room that everyone is banned from as it’s only for friends and family to stay over in.It’s the only room in the house that’s free from little hand prints on the walls and everywhere else ! I’d put it in the lounge. This is perfect for my reading book -I am totally in love with this lamp! I would put it in my living room! They look great. I would have it in the hallway, so everyone that comes to my door would see it. In the living room next to an arm chair. we have just moved house and decorated the living room and don’t have a lamp yet so that’s where this would go if i won! LOVE it, thanks for the chance! In my cosy corner where I listen to my favourite records and read my cherished books. In the livingroom it would be a stylish addition and i would use it while watching TV in the evenings in those cold winter nights. Living room or bedroom depending on it’s size. In the living room to add some real chic. In the living room, next to the sofa. I would love to give the lamp a new home on my lounge side table. It would look amazing and would bring me so much joy to use! On top of the bookcase in our living room, pride of place so everyone can see it! It would look so beautiful in my bedroom! It would go in the living room corner…right next to where I sit. it would take pride of place in my front room. Thank you for the opportunity to win this lamp, its beautiful! It would go in my living room, I don’t have any lamps in there! I’d love it near my armchair near my bookcases at the reading end of my lounge. I’m about to move home so I’d use it to jazz up my new living room! It would get pride of place in my living room. In the living room – will look lovely! I’d put it in my lounge. I’d have it in the lounge so everyone can admire it and I old enjoy it to its full . I think it would look nice on the small table at the side of my sofa. I would love a pooky light in the dining area, very chic. This stunning lamp would look perfect in my living room! In my hallway, a lovely welcome for everyone to see. Lovely this would look amazing in my dining room. We have just purchased a gorgeous new cabinet for our lounge and this would look delightful on you of it. It would be the perfect place for light within the room, and great as it near my chair where I relax read and sometimes draw. This would be great in our lounge! On my bedside cabinet in my room! In my spare bedroom that we are just decorating! 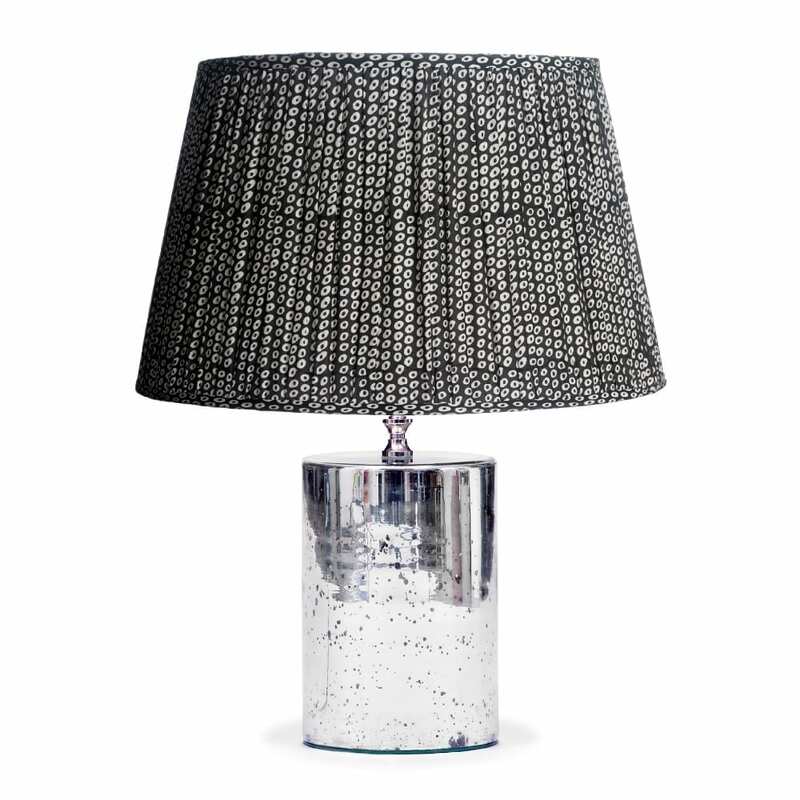 I would put this lamp in the conservatory to brighten things up over the darker months! In my living room because the colour scheme is Purple, silver, black and white. I would put it in my living room. Beautiful by the way. I would have it in the living room where we all can look at it! This would look very lovely in my living room. Would make it much more stylish. I would love to put it in my hallway. In my living room where everyone can see it. my living room NEEDS this! The table in our living room. I would pop it in my bedroom where I’ve just spent a fortune in re-decoration. I have a wonderful spot for this. It would be perfect in my living room. My living room is in desperate need of additional lighting so I would definitely be putting it in there. In my lounge – it has a monochrome style and would fit right in. This would look lovely in my living room.